Former Liberian president Ellen Johnson Sirleaf described herself as an imperfect leader on Friday when she accepted the prestigious $5m Ibrahim Prize for Achievement in African Leadership. "As the first woman to receive this Mo Ibrahim Foundation Prize award, it is my hope that women and girls across the continent are inspired to break down barriers," said the 79-year-old who left office earlier this year. "Where there is a first, there will be a second." The world's richest individual prize is given to a democratically-elected African leader who has demonstrated exceptional leadership, served their mandated terms and left office within the previous three years. The award comes with $5m, which is paid over 10 years, and $200 000 annually for life from then on. "I stand before you today an imperfect leader, from a complex, post-conflict society, on a continent of uneven progress, during a time of global uncertainty," she told an audience of African and foreign officials in the Rwandan capital Kigali. Sirleaf is no stranger to international acclaim having shared the 2011 Nobel Peace Prize as a champion for women's rights. The Ibrahim prize, founded by Sudan-born telecoms tycoon Mo Ibrahim, has only been awarded five times since its inception in 2007. 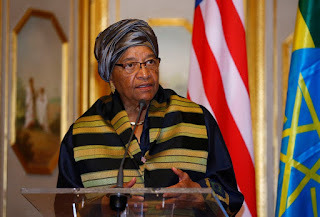 When Sirleaf's win was announced earlier this year Ibrahim praised her leadership of Liberia. "In very difficult circumstances, she helped guide her nation towards a peaceful and democratic future, paving the way for her successor to follow," he said in February.